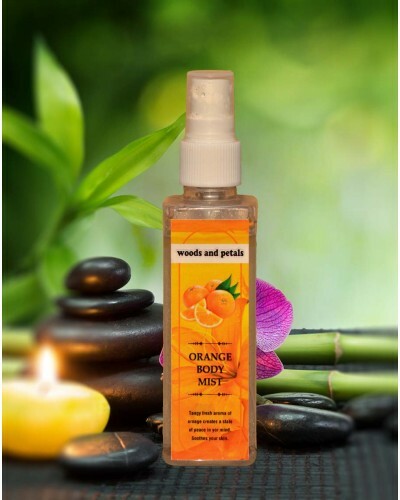 Alcohol and paraben free mist. The tangy fresh aroma of orange creates a state of peace in your mind. The tangy fresh aroma of orange creates a state of peace in your mind. It will alleviate anxiety and depression. As it is an alcohol free formula, it is ideal for very delicate skin. It will not dry your skin as there is no alcohol. Shake well before use and can apply on whole body. Simply sprits onto wet or dry skin for the ultimate refreshing experience. • Disclaimer: Check the product on a small portion of your skin to make sure you are not allergic to the product and avoid spraying into eyes. Keep away from high heat or flame. We are not manufacturer of any personal care products. We only supply products of original and reputed vendors across India. All products are dispatched directly from the vendor with their original packing and safe guarded by wishvilla’s packing.